O3 Group are a one stop shop for all your washroom and kitchen hygiene requirements. We offer a wide range of products and services including washroom design and refurbishment, sanitary waste bin disposal, air freshening, hairdryers, hand dryers, washroom dispensers, vending machines, baby changing facilities, pest & germ control, kitchen hygiene products and much more. Our products are sourced from top leading brands such as Dyson, Veltia, Aertek, Dolphin, FemiBin, UriFreshEco & Mitsubishi. Our popular waterless urinals eliminate urinal odours, saves money & energy and improves hygiene. The UriFresh Urinal Sleeve Sanitiser regulates water flow, prevents blockages & smells and keeps water usage to a minimum. O3 Group offer our own unique ‘FemiBin’ Sanitary disposal units which are placed in each cubicle. We will discreetly replace on a regular basis with little disruption to your workplace. O3 Group offer standard and bespoke washrooms for Schools & Sports and Leisure facilities. We are able to carry out a full service including site surveys, proposals with drawings and images, advice, manufacture and installation. O3 have a solution to suit all requirements whether a particular budget or style. O3 group have a comprehensive range of products on offer to keep your kitchen safe and running effectively while complying with kitchen hygiene legislations. 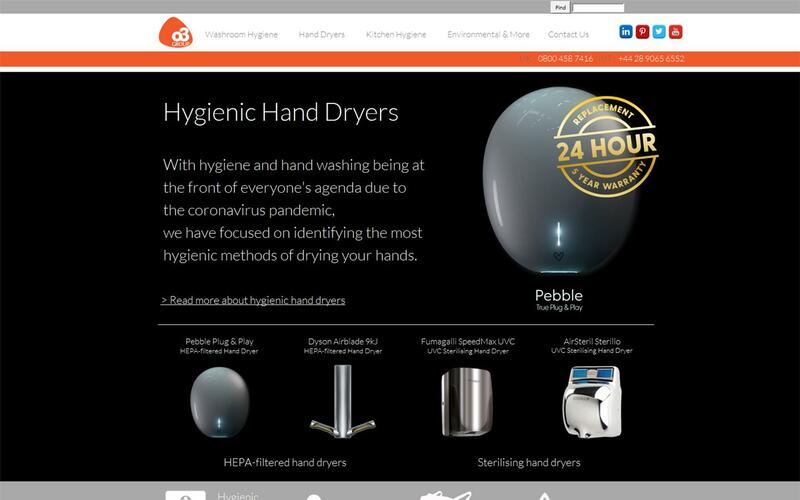 Our products include electronic fly killers and zappers, glue board fly killers, fly screen windows and doors, chain screen doors, PVC strip curtain doors, sterilisers, sanitisers, dispensers, odour removal, bins, floor signs, centre-feed rolls & first aid kits.